I think there's something missing from our nation's culture. Something glaring, which should have been addressed sooner. We sing the same song at the opening of every sporting event, year after year: The Star-Spangled Banner. Of course we do, it's our national anthem. But shouldn't we have a backup? Y'know, in case the Star-Spangled Banner should find itself unable to perform? What would we do? Just stand there with our hands over our hearts shifting awkwardly for two and a half minutes? Or just recite the Pledge of Allegiance only to end up cringing when inevitably everyone who had a worse 6th grade teacher than I did puts a pause between "one nation" and "under God," because it then sounds like you're the one who did it wrong, but really you're the only one in a 10 yard radius who did it right? Who wants to do that? To nationally declare "Don't Stop Believin'" as the official Vice National Anthem. Second in command. I'm not saying replace the Star-Spangled Banner. It's earned its place and deserves respect. But what if the track skips, or someone freezes with stage fright on the field, unable to sing? What if the Star-Spangled Banner gets banned for some unforeseen reason (stranger things have happened, right?)? I say we need to be prepared. 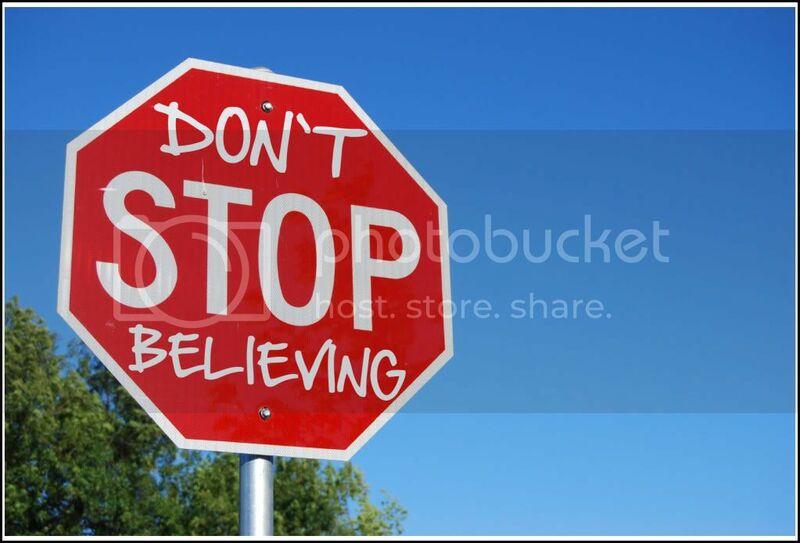 And what song is more beloved in the American public than Don't Stop Believin'? Everyone knows the words. At least as much as anyone knows the words of the Star-Spangled Banner, if not more. You can't live in the United States for more than 15 minutes without having heard that song any less than 30 times (I don't know how that's possible, but Don't Stop Believin' defies the space-time continuum or something). You learn the words purely through osmosis. So it's not like we'd be teaching an entire nation a new melody. Easy to phase in. An inspirational moment of epic proportions before all sporting events. Picture it: we all "rise for the singing of our national anthem," putting our hands over our hearts and turning our gaze towards the gigantic American flag. We wait in silent anticipation until we finally hear that iconic, unmistakable bass line travel over the stadium speakers and into our hearts..."bum...bum bum bum...bum bum bum..." Smiles sweep across people's faces. Fist pumps fly through the air. Head nods slowly gain momentum, and we all join in: "Just a small town girlllll..." until we finally reach the triumphant ending we've all been waiting for and sing our little lungs out to the heavens above: DONNNN'T STOP! BELIEEEEEV-AN! HOLD ON TO THAT FEE-EE-EE-LAAAAN! I'd wager that the players would be so inspired by that point that the game would have 120 percent more heart than if we had just sung the Star-Spangled Banner. I think you'd be hard pressed to find many things cooler than hearing 18,000 people singing Don't Stop Believin' in unison. Correct me if I'm wrong (but I'm not). The potential for the President to do an air guitar solo. I'd be okay with that. In fact, I'd encourage it. Some may view that as irreverent, but I just see it as the leader of the free world pouring his heart and soul into our Vice National Anthem out of respect for our great country. And if we collectively allow Toby Keith songs to represent our attitudes towards other countries, we should allow this. If you agree (which you should, given my solid arguments), what are some other reasons DSB should be our Vice National Anthem? If you don't, what song do you think should wear that honor?